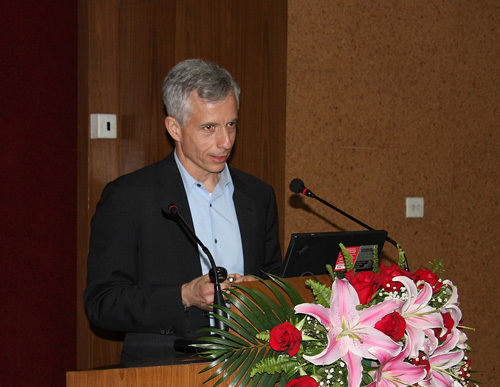 Professor Eric N. Jacobsen from Harvard University visited Shanghai Institute of Organic Chemistry, Chinese Academy of Sciences (SIOC) at the invitation of SIOC director, Professor Kuiling Ding, on May 13. Professor Jacobsen delivered a Wang Yu Memorial Lecture titled “Attractive, Non-Covalent Interactions in Asymmetric Catalysis: Links between Enzymes and Small-Molecule Catalysts” at SIOC during his visit. Professor Guoqiang Lin, Chairman of Academic Committee of SIOC chaired this lecture. The lecture aroused strong attention and great interests among the audience. Professor Jacobsen made an academic report at SIOC on May 13 for "wang Yu memorial Lectrueship of 2010". development of organic chemistry and the related areas in China and promote international scientific cooperation on an advanced level at SIOC by inviting world-renowned organic chemists from abroad and/or at home. Professor Eric N. Jacobsen is a leading chemist in the world. His research interests focus on the discovery, mechanistic elucidation, and application of new reactions, with special emphasis on asymmetric catalytic processes. Through the development of chiral Schiff base complexes of main group and first row transition metals and of novel urea and thiourea catalysts Jacobsen has discovered effective and – in certain cases – highly practical methods for enantioselective catalytic oxidation, hydrolytic, and carbthe late Prof. Wang Yuon-carbon bond-forming reactions. Professor Jacobsen has been conferred many prizes and awards including the NSF Presidential Young Investigator Award (1990), the Packard Fellowship (1991), the Camille and Henry Dreyfus Teacher-Scholar Award (1992), the Alfred P. Sloan Foundation Fellowship (1992), the ACS Cope Scholar Award (1993), the Fluka “Reagent of the Year” Prize (1994), the Thieme-IUPAC Prize in Synthetic Organic Chemistry (1996), the Baekeland Medal (1999), the ACS Award for Creativity in Synthetic Organic Chemistry (2001), the NIH Merit Award (2002), election to the American Academy of Arts & Sciences (2004), the Mitsui Catalysis Science Award (2005), the ACS H.C. Brown Award for Synthetic Methods (2008), election to the National Academy of Sciences (2008), and the Janssen Prize (2010).